We get together for large and small events. You need not be a member to attend most of them, however membership usually allows you to take advantage of discounted rates (for those events that charge for participation). If you would like to view all of our currently scheduled events, please see the Events menu. We have national Gatherings once each year in winter in various locations around the United States. For details, please see our Events menu. Hear national artists & PMN members from around the country. 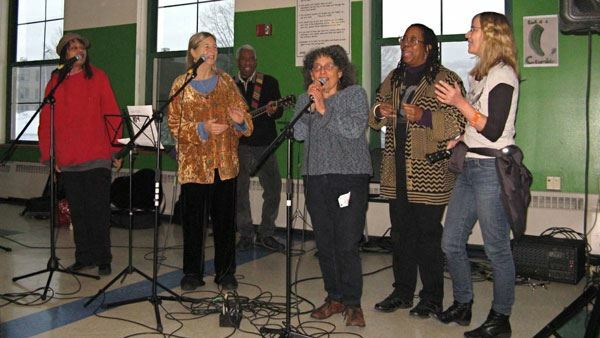 Weekend participants lead workshops highlighting group singing, song sharing, and skills for using music for progressive social change (e.g., performance, songwriting, music promotion & using song in struggles for justice). Saturday night we gather for a Round Robin song share where attendees are invited to perform a song for the group and to enjoy the music of others. We make the weekend more affordable by organizing homestays nearby with PMN members and supporters. Meals are included in the registration fees. Special rates for members, different income scales. Financial aid is available. We have scholarships for artists of color and for young artists. You can see what happens at our Gatherings by checking out our Past Gatherings page. For More Information about Gatherings, please contact Ben Grosscup. We open our Gatherings with a big concert, featuring new and established artists who use their art to promote peace and social justice. We also host other concerts from time to time. A number of local PMN members host regular or spontaneous song and poetry swaps in various locations. If you’d like to join a song swap, please get in touch with the organizer. If you’d like to start a PMN affiliated song/poetry swap in your area, please contact Ben Grosscup, PMN Executive Director.